The Atlantic Council’s South Asia Center held a discussion on December 4 with Mohsin Khan, senior fellow, Rafik Hariri Center for the Middle East, Atlantic Council; and Paula Newberg, Marshall B. Coyne director, Institute for the Study of Diplomacy. After a tumultuous 2011, this past year saw the United States and Pakistan attempt to right their teetering relationship. A revival of government-to-government contacts and potentially the renewal of the abandoned strategic dialogue of 2010 appear to be in the works. But strong anti-Americanism inside Pakistan, even among traditional friends of the United States, and heightened public protests against the drone campaign have created a challenge for the Pakistani authorities. In the United States, vocal criticism of Pakistani actions and lack of movement against Afghan Taliban groups inside their borders have led to calls for disengagement or containment by members of the US Congress and US military in Afghanistan. As President Obama prepares for a military withdrawal from Afghanistan by 2014, will the United States be able to stay connected to the region and Pakistan? Pakistan too is preparing for parliamentary and presidential elections and a change in the military leadership in 2013. Will these changes create greater instability, or will its fledgling democracy mature rapidly and set the course for a stable polity? The potential transformation of the region hinges on the answers to these questions. Mohsin Khan is a senior fellow in the Rafik Hariri Center for the Middle East focusing on the economic dimensions of transition in the Middle East and North Africa. Dr. Khan was a senior fellow at the Peterson Institute for International Economics since March 2009. Previously he was the Director of the Middle East and Central Asia Department at the International Monetary Fund (IMF). This department is responsible for monitoring macroeconomic developments and providing policy advice to 32 countries in the Middle East, North Africa, and Central Asia, and for advising IMF management and Executive Board on country-specific and regional matters. He holds degrees from Columbia University (MA) and the London School of Economics (BSc. and PhD). Dr. Khan’s publications cover macroeconomic and monetary policies in developing countries, economic growth, international trade and finance, Islamic banking, Middle East oil markets, exchange rates, and IMF programs. He has edited 7 books, published numerous articles in major economics journals, and serves on the editorial boards of 10 academic journals. In 2003 he was awarded the Islamic Development Bank Prize in Islamic Economics for outstanding contributions to the field. Paula R. Newberg is the Marshall B. Coyne Director of the Institute for the Study of Diplomacy and Visiting Professor in the School of Foreign Service at Georgetown University. A scholar and practitioner with wide-ranging experience in multilateral and nongovernmental organizations, Dr. Newberg specializes in issues of democracy, human rights and development in crisis and transition states, with particular interest in south, southwest and central Asia. She served as a special advisor to the United Nations and the United Nations Foundation in Africa, eastern and central Europe, and central and south Asia, with multiple postings in Afghanistan. Dr. Newberg was a senior associate at the Carnegie Endowment for International Peace, where she co-founded its Democracy Project and chaired the South Asia Roundtable, and was a guest scholar at the Brookings Institution. A former foundation executive and columnist, Dr. Newberg taught in the graduate faculties at Columbia, Rutgers and Johns Hopkins University for many years, and has published extensively on issues ranging from telecommunications policy to law and constitutionalism, insurgency and rights, rights and foreign policy, and international assistance. A graduate of Oberlin College, Newberg received her doctorate in political science from the University of Chicago. Shuja Nawaz: – Crack the Pakistan Code. We have on the roster, three eminent experts on the country, and although I’m normally reluctant to use the word expert with Pakistan because it’s very difficult for somebody to say that he or she gets Pakistan. I think the group that we had originally intended to bring together for this event certainly fits that category. Unfortunately I regret that Ambassador Haqqani could not make it. He had plans, he had even booked his flight, but he is quite ill. I think he caught some kind of a cold and is recovering from it, so he couldn’t make the flight. So we will unfortunately not benefit from his presence. Although he has been kind enough to send some talking points and I will gladly share those with you too, to set the ball rolling. But we do have two other eminent experts, and in the order in which they’re going to speak let me just introduce them briefly. We have Paula Newberg who’s done a fair amount of travel and work on Pakistan. She has been the Marshall Coyne Director of the Institute for the Study of Diplomacy and a visiting professor in the School of Foreign Service at Georgetown. She’s worked in the policy field; she’s also been a practitioner and she’s a scholar. One of my own personal favorites of the work that she’s done has been a work on Pakistan’s constitutions. And that remains probably one of the best books on the subject written. Nobody has yet tried to supplant it. She has had a very eminent career working with the United Nations, with the United Nations Foundation in Africa. She’s had postings in Central Asia and Afghanistan, and also is a Senior Associate at the Carnegie Endowment for International Peace, where she co-founded its Democracy Project and chaired the South Asia Roundtable. She’s also been a guest scholar at Brookings. I won’t go into all the other details of her illustrious career, but let me move onto Mohsin Khan. Mohsin is a former colleague at the IMF where he was Director of the Middle East and Central Asia Department. He is currently Senior Fellow in the Rafik Hariri Center for the Middle East, focusing on the economic dimensions of transition in the Middle East and North Africa. 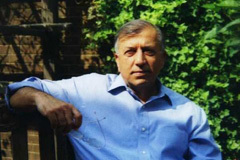 Mohsin was a senior fellow at the Princeton – at the Peterson Institute for International Economics since March 2009, and he has published a long list of books and articles dealing with the macroeconomics of Pakistan and the region. So he will be able to give us his take on the economic situation in Pakistan and then what to expect as we go ahead. The way I plan to organize this event, particularly in the absence of Ambassador Haqqani is I will give you a very quick rendition of his talking points so that they are in everybody’s mind as we go forward. Then I’m going to request Paula and Mohsin Khan to talk about the economic situation and then we’ll have Paula Newberg try and do the political economy of Pakistan as it were, and also look at the U.S. Pakistan relationship. The reason why we chose this topic – and it was just good timing in many ways – is that the United States and Pakistan are now apparently coming out of a trough of a very poor relationship. At least a dialogue has begun at the working group level, so what used to be known as the strategic dialogue is going to be revived in some way and we hope that it will pick up steam. And it’s highly critical that these two countries that have often been described as friends or enemies or frenemies, find a way to understand each other going forward, particularly in light of the transition in Afghanistan. And it’ll be interesting to see to what extent they have managed to find a way to converge their ideas and their actions and their intentions. So our session today should give you some food for thought – I hope. Now, pretend that I’m Husain Haqqani, and so what I say next is not me, it is really Ambassador Haqqani’s thoughts, which I will convey to you. His basic contention is that there’s a fundamental disconnect between Pakistan’s regional aspirations and the United States’ expectations. Pakistan’s many paradoxes make it difficult for the Obama administration to go beyond the current, quote, unquote, event-driven relationship. Under this heading the Pakistani democracy has yet to find a balance between politics and polity. Domestic politics in Pakistan makes it impossible for the government to keep promises in key areas of interest to the United States. And these include counter-terrorism, Afghan Taliban safe havens, nuclear proliferation and de-radicalization. Further, anti-Americanism in Pakistan is coupled with dependence on U.S. assistance, and the economic needs of Pakistan force it to seek U.S. aid. But national sentiment remains hostile to the United States. And every few years a new explanation is offered for this anti-U.S. sentiment, the latest being the frequency of drone attacks. Further, the anti-Americanism in Pakistan goes back several decades. The mood in the U.S. Congress and the media in the United States has hard considerably after the raid on Abbottabad and Ambassador Haqqani feels that this is unlikely to change. What makes it very difficult for the Obama administration to ignore Pakistani anti-Americanism, unlike Reagan or the Bush Administrations is this mood change in Washington. Within this rubric Pakistan’s military wants a deal with the U.S. on the so-called end game in Afghanistan. But too many variables, the policies of India, Iran, different Afghan factions and the actions or policies of the Pakistan-based jihadi groups make it very difficult to accomplish. His third point is that both sides, the U.S. and Pakistan will continue to talk of a strategic relationship, but it is unlikely that Pakistan will forego its nuclear and asymmetric warfare options that are at the heart of this disconnect between the two countries. The relationship according to him is undergoing a very serious re-evaluation. The old paradigm of tweaking it with joint statements and aid packages might not work very well anymore. The mistrust is deeper and civilian leaders with an eye on elections and facing activist media and judiciary at home cannot afford secret deals and arrangements like they did in the past. His fifth point is that Pakistan faces major decisions on the domestic front, but those decisions are not being made. Society as a whole, including the media and judiciary are far more influenced by Islamist radicalism than is understood in the United States. And finally he believes that security concerns and overall negativity continues to undermine Pakistan’s economic goals in trade and in attracting foreign direct investment. Political factors make progress difficult in the energy sector and tax collection reforms. This means that the dependence on external flows and the anger and frustration caused by conditionality associated with such flows is unlikely to diminish any time soon. Now that’s the end of Ambassador Haqqani’s talking points, but there was no planning and no coordination in the way his talking points ended because I think it provides an excellent segue for Mohsin to pick up on particularly his last point. But feel free to talk about any of the others as we go forward. So, Mohsin, the floor is yours. Mohsin Khan: Thank you. Thank you very much, Shuja. It’s a pleasure being here. Knowing that Ambassador Haqqani was going to speak first I had no idea that I would be speaking so quickly into this session. But be that as it may. So, first of all Shuja asked me – or somebody from Shuja’s shop asked me to come and talk about Pakistan and said would you come and speak at this event we’re having called Cracking the Code to which I said I’d be happy to speak, but I have no idea what the title means. But then Shuja was kind enough to explain it to me. So let me just talk about three – I’ll make three points. First of all, just to give you an overview of the Pakistan economic situation. I imagine many of you are familiar with that, but let me give you my take on that. Secondly I’ll talk about economic policies and reforms and what is needed and what is feasible in the country. And finally I will talk about how do you get – if you think of Pakistan possibly being in a crisis situation now, as most people think it is, how do you get from the short run crisis to a long run, which is a long run strategy for economic development. So let me start with the overall economic situation in Pakistan. I don’t think I’m being sort of too dramatic in saying the overall economic picture in Pakistan has been – is really quite grim, but in fact it has been grim since about 2008, so it’s the last four years. With virtually all the indicators you can think of – virtually all, not quite all, but virtually all – pointing to an economy which is under considerable stress. For example growth has been – since 2008, being averaging around – has been averaging about 3%. It’s going to be 3% this year too. Now this is in a country where population growth is 2% plus. This is sort of a clear recession in Pakistan terms or in developing country terms this is a recession that the country’s been going through. And the fact of the matter is that the country needs seven to 8% growth if it’s going to absorb the growing labor force. The labor force is growing at 3% per year and so you need seven to 8% just simply to create enough jobs for the labor force. Furthermore you’ve got the other – problem on [inaudible], which is that the labor force is getting younger and younger, or in fact the potential labor force is getting younger and younger. So young people are without jobs. So that’s one indicator. It’s a dire indicator. Inflation has been in double digits since 2008. It’s come down a little bit last year – or this year, part of this year and late last year, down to 11%. Still in double digits. It has been much higher but it’s still in double digits and around 11% – running 11%. The fiscal deficit of the country has basically been growing steadily. This year in fact it will hit its historical peak of 8.5% of GDP, which is almost twice what was in the budget. In the budget the deficit was expected to be 4.7, it’s going to turn out to be 8.5%. Interestingly enough, I mean in the next year’s budget too it’s 4.7 – the deficit. That hasn’t changed even though the fact of the matter is that there was sort of severe underperformance on the revenue side related to expectations. But runaway expenditures on the other side during the course of the year. And more problematic I think – or equally problematic is that this budget deficit has been financed primarily by the government borrowing from banks. And what happens in Pakistan is this sort of circular thing where banks in fact are – buy government treasury bills. The central bank then refinances them so the central bank is pumping in money into the economy to the banks so that the banks can buy treasury bills from the government. It creates two particular problems. One, an inflationary problem because this is printing money. The other is that it continuously pushes up interest rates in the economy and then that starves the private sector of credit because credit is very expensive then for the private sector. So – and lastly, my other indicator, which is of course the indicator that the Pakistan economic team and the Pakistan government always look at is external imbalances. These external imbalances have been rising steadily. As a result foreign exchange results have been falling and international reserves now are at less than $10 billion, and next year if nothing else happens I think they will fall very sharply. So there’s a potential – don’t know how long it’s going to be, but there’s a potential for a balance of payments and a currency crisis on the horizon. So that is the sort of broad picture that we have in front of us and the question really is, you know what’s the government going to do about this. I just digress for a minute and say look, I’ve given you a real gloom and doom story here. There are some bright spots too in that economy in the economic situation in Pakistan. And let me just point out and mention a couple of these – two or three of these. First of all, there is – for those of you who have been in Pakistan, either recently or in the past couple of years and I go a lot, there’s a disconnect between the indicators if you look at growth, inflation and so on and so forth and what’s going on – the economic activity that’s taking place in the cities for example. Or even in the rural economy in the agricultural sector. There’s a lot of economic activity. There’s a lot of things going on and that of course is the informal economy. The informal economy in Pakistan out of the – has been growing very steadily. The most recent estimates I’ve seen is that the informal economy represents about roughly half the official economy. So we’re talking about $100 billion plus informal economy working side-by-side with the official economy. Now informal doesn’t mean illegal in any sense that this is illegal activities. It’s just undocumented and it’s not subject to – and there are no taxes. They don’t pay taxes and that. Now that’s chugging along very nicely and it’s very – and you know I mean the reason – and there’s a lot of activity going on which is completely outside the government’s net. It’s not governed by taxing obviously, but it’s not governed by regulations or anything of that nature. The most glaring example you’ll see of this in any city where you find suddenly sort of buildings appearing in areas – let’s say even in government parks. These are illegal buildings, but nevertheless they are okay. So there is construction activity. It’s not just sort of services, it’s actual production going on. The other bright spot I guess – bright indicator is the rise of the middle class – or the growth of the middle class in Pakistan. The Asian Development Bank in 2010 estimated the middle class to number about 70 million in the country, which is high for a country that’s around 175 million. 70 million of the people are defined by Asian Development Bank as middle class. That’s been happening. There are various indicators that say that this is – that there is a growth in the middle – there’s a growth in the informal economy; there’s a growth in the middle class. A lot of indicators like that. For example the number of cell phones registered in Pakistan. It’s 120 million cell phones registered in Pakistan. There are 1.5 million motorcycles being registered every year. There are half a million cars being registered every year. There’s sort of – now what I’m point out is that there is a tremendous growth going on in consumer spending. Now that fits in with the informal economy idea, but also says that there is economic activity going on that the government has not seen or is not capturing in its official statistics. How is it being financed? Well, part of the financing is coming from remittances. That’s the third bright spot on the external side. Remittances this year will amount to $14 billion. Now that’s a very large number and they’ve grown from about seven in 2008, about 7.5 billion in 2008 to almost double that in 2012. Now remittances – worker’s remittances of course ease the balance of payments problem, they finance the informal economy, yes. These are official remittances by the way. And there just is a real puzzle in Pakistan that’s constantly being raised, is you know why are remittances growing at this rate in Pakistan? Now, what’s going on? Why are people sending more money to Pakistan? Well, a variety of explanations ranging from, you know altruistic motives that people abroad feel that the economy is doing badly at home and therefore they’re supporting their families and they’re sending more money to Pakistan. A variety of explanations. Now these by the way, even in the downturn in the West – in the recession in the West, the money kept flowing. It’s sort of there are two implications of this. One is that when people talk – and I’ll come to that – when people talk about the desperate need that Pakistan has for external financing, yes, it does. But put this in perspective, you know. Even if the entire Kerry Lugar bill goes through that Kerry Lugar will represent just 10% of the inflows of foreign remittance – of remittances. And remittances don’t carry any conditionality; they don’t carry any treaties, nothing. You know this is money just coming in. So, you know you may hear a lot of Pakistani officials saying we desperately need 1.5 billion or $1 billion from the United States. Well, they need it, everyone can do with an extra $1.5 billion, but it’s not essential. It’s not absolutely – I mean in my mind it’s not essential. It’s not – I mean relatively speaking that is. The second thing is that in this puzzle what is going on in [inaudible]? Well, one explanation that has come up is that a significant part of these remittances are in fact payments for services being done. And I’ll give you – the example I’ll give you is IT. There is what some people call a cottage IT in the software industry in Pakistan going on where people in their homes and their garage and so on are in fact writing software applications and this goes on by Dubai, by the way. And they’re paid through the remittances channel, which is the channel you would pay anyone in Pakistan because it’s not taxable. So you know you provide software for a company, you get paid in formal remittances. So I think that that is – those are three bright spots, which have really not much to do with the government. These are fortunes, you know economic fortunes and [inaudible]. There is one important policy move that the government has taken – well, actually there are two. One I’m not so thrilled about, which is the devolution and the NFC award. But that’s a different question. I’ll tell you, the game changer in my view is the change in the Pakistan attitude towards trade with India. India-Pakistan trade is the game changer and I think this could be potentially the most important step that this government, you know on a policy level has taken. Or any government in Pakistan for a long time. This – the situation is now as follows. At the end of this year or the beginning of 2013, Pakistan will finally grant most favored nation status to India. And whereupon it has already eliminated the positive list – the positive list is a list of goods that you can import into the country. Roughly 2,000 of them existed in the past. It switched it over to a negative list of something like 1,200 items, which are items which are excluded. They cannot be imported. Everything else is subject to tariffs. Can be imported and subject to tariff. By the end of this year – at the end of this month the government of Pakistan will reduce the negative list from 1,200 items to a very small number of items that have to do with health, religious, et cetera, which every country maintains. I think that trade going on at roughly two billion – $2.5 billion a year between India and Pakistan could in the next few years get up to six to ten billion. Provided the infrastructure’s in place, et cetera, and in that sense it could be a real potential game changer for the economic development of Pakistan. So in terms of economic policies and reforms going forward – well, everyone knows what the constraints are, what are being the serious problems in Pakistan – energy sector is a critical problem. That’s the first. I’m sorry, I’ll abstract – I’m an economist I’ll abstract and leave security and political considerations to my fellow experts. As an economist I see energy as being a fundamental constraint. A lot of people say oh, it’s just bad governance. Yeah. In stored capacity in Pakistan it’s sufficient and it’s just bad governance, they don’t collect, they have line losses, et cetera, et cetera. That’s not true. I mean the facts of the matter are that in stored capacity in Pakistan if you take up everything, whether it’s used or not used, okay – or it’s decrepit or functioning it’s roughly to give you an idea, 15,000 megawatts is the in stored capacity in Pakistan. Peak demand in Pakistan is 20,000 megawatts. Okay. So you’ve got a 5,000-megawatt shortfall straight off the bat. Whether you talk about line losses or anything like that, even if you’re producing at full capacity and you had no problems in collections, et cetera, you still have this shortfall of [inaudible]. So instead of having, you know 12-hour load shedding, okay? You’d have three-hour load shedding, but you would have load shedding, you couldn’t do anything. So that’s something that has to be tackled – energy sector – or reforms. And that’s not going to be easy to tackle. Then of course you have the other standard list of reforms the country needs to undertake. Husain mentions tax reforms. Yeah, I mean I think that [inaudible], you know – let me just say that perhaps an extension of the general sales tax to a couple more goods, perhaps services. VAT is dead on arrival. VAT will not fly at all. So if the IMF or whoever puts that as a condition for a loan, it’s not – I mean I’m just telling you now, it’s not going to happen. VAT is dead. Collections are the main thing. How do you collect income taxes and so on? That’s where they’ll have to put their efforts into. The third main reform is reform the state-owned enterprises, the Pakistan International Airlines, railways and so on and so forth. Right now that is an enormous drain on the budget of the country. And what happens typically is that the government makes up numbers of how much the subsidies are going to be and it’s always less than what they were last year. And they turn out to be much greater. Subsidies are primarily in the area of state-owned enterprises. So you have to state-owned enterprise reform. Now you have to move with these reforms into what is called the new-growth framework that the planning commission of Pakistan has developed. And the deputy chairman was here a session a few months back to talk about this, but you have to get – I mean it’s a very good strategy. But you have to get from the short-term crisis to the long term where you can have things – we can handle things like innovations, entrepreneurship, development of youth, creative cities, et cetera, et cetera. These are all very good things to be aiming for as an economic development strategy, but you’ve got to get from here to there where you can do it. And I think that’s the issue right now that the country faces. So that’s my third point, it’s the bridge from the short run crisis to the long run development strategy and for that you need external financing. And so where is this financing going to come from? Well in one form or the other it’s going to come from the U.S. Direct? Yes. I mean that’s the discussion that’s still going on – the U.S. Congress attaching conditions and so on and so forth. But I think it’s going to come mainly from the international financial institutions and that’s where the U.S. would have the leverage. Because you know basically the discussions that are taking place right now here in Washington with the IMF, with the World Bank and so and so forth, are to do with getting financing from the international financial institutions. The most recent discussion at the IMF board on Pakistan, there was a – it was a very negative view expressed by many executive directors in many countries about the Pakistani’s economic performance. But that’s happened in the past too. And it really depends on where the U.S. is going to come out on this. Is the U.S. going to support Pakistan’s case in the IMF or not? And I think that’s the leverage that – I think when the Pakistani’s say we’re looking for external financing and we’re looking to the U.S., they’re not looking to the U.S. for the money. They’re looking to the U.S. for the support in the international financial institutions. Paula Newberg: Thank you, Shuja, thank you all for coming. I’m going to blame my presentation on Husain Haqqani also. I was expecting him to be pithy and political and provocative and then I could be high-minded and moralistic. So let me start off by saying that many of the comments that Shuja offered on Hussein’s behalf, I actually agree with, but I think I may look at them slightly differently. So I’m going to try to do a couple things at once. And one is to talk a bit about the U.S. Pakistan relation and the other is to talk a bit about the factors in each of these countries, particularly in Pakistan that make a difference in how this might work out. So let me just do this since I was given initially seven minutes – to try to do this with a series of precepts and then we can discuss some of these issues a bit at greater length during the discussion. So although this may sound like it’s a truism, I think it’s worth saying that with regard to the U.S. Pakistan relationship both countries needs to get their houses in order. It’s not just the last decade of blaming, but many, many decades of blaming each other for poor performance. And foreign policy has gone really almost nowhere and it’s led to too many years of expedient policy, occasional duplicity, very often short-term thinking and many, many excuses for poor policy. The second is to say that I think it’s extremely important to look beyond just current events. Most of the discussion in this city of late has been about what happens post-2014. 2014 is one small step on a very, very long road that started quite some time ago and with luck will continue for a very long time. It’s a critical moment, but it isn’t the only thing. The important part about this is that neither Pakistan nor the United States can be tied to each other’s short term agendas and for that matter even each other’s current problems. That’s extremely important particularly as we enter into an election year in Pakistan following an election year in the United States. It’s very difficult to know how to bargain when you don’t know who you’re bargaining with. And when Americans tend to look at Pakistan all they see are the problems in Pakistan’s governance environment. And they are huge. The list is extremely long. When Pakistanis look at the United States they see quite a lot of problems and a lot of uncertainty as well. And we, on this side of the ocean tend to forget that also. So as you can imagine where I’m going with this is to say that governance in both countries is critical, not only about learning who your potential partners are but looking at where the points of stasis might lie and what the external constraints on each country are that affects the way in which they deal with one another. And the confusion in Pakistan in this regard is particularly important for Americans because if you take a look at the front page of any Pakistan paper on any given day, it all looks as though it’s all very confusing. Because no one knows where anyone else is going and that leads to bad policy, poor responses, highly reactive and much more than reflective concerns. And a confusion that seems almost interminable to insiders and outsiders alike. With that – I mean I would point you for example to the headlines in today’s papers, both American and Pakistani. If you look at the front page of Dawn, what you’ll see is a series of items, all of which are extremely important but none of which seem to look very promising. The Supreme Court now wants to set up a judicial commission the Lao Mustad events of many years ago. It also wants to set up a judicial commission on the law and order events in Karachi. There’s a tremendous amount of confusion in parliament today, yesterday, last week and for the last several years. And the problem is it is also considering whether to officially create a different kind of relationship between Pakistan and Iran. Now what do all of these things say? They all look as though they are short-term corrective measures within Pakistan. They’re highly instrumental. They’re not terribly visionary and they’re one set of institutions trying to make corrections for someone else and that’s a very, very hard thing for anybody outside to look at. If you look at the New York Times what you’ll see is much sadder commentary. And what’s happening in Baluchistan where you have problems of sect and class and caste reflected in sectarian assassinations but also insurgencies in a place, which is in many ways among the most important to the Americans when they look at Pakistan. So this is not a picture that’s easy to comprehend. And we can talk in large terms about asymmetrical relationships and policies and practices. But in the end it very often comes down to what you see every day in the papers and what you think might be the prospect for some kind of improvement. And for Americans, Pakistanis don’t look as though they’re improving much at all. Which is why in many ways Mohsin’s comments are extremely useful because as in economics, as in politics, there’s always a balancing that’s going on and it’s not often accessible to everyone who’s watching. In this regard, and with regard to these sorts of headlines, the 2013 elections to my mind are extremely important. Now each time Pakistan has elections we all sit back and say wisely well this is going to be the game changer and it rarely is, but it’s nice to think that it might be. I prefer to think of it slightly differently and the story kind of goes as follows. For everything that we on this side of the ocean think about what is wrong with Pakistan’s politics, I look and say how will it look ten years from now. In ten years from now you might go back and look at 2011 and 2012 and say the parliament tried to act more professionally. There were rules put in effect for choosing judges. There were rules put in effect for how you deal with devolution and decentralization. Whether or not they all work is another activity. But in the end you see institutions in a changing state potentially trying to do better. Now to make them do better is different than simply outlining what the policy is. But it does suggest that if you take all of the socioeconomic factors that are important in Pakistan now and add them to what looks like some policy change it suggests that maybe with changing democracy and changing economies you could look toward a state that is somewhat more responsible and somewhat more capable toward its own citizens. And while we in the United States think that Pakistan is in business to be more responsible toward us, it’s actually their own citizens that’s really the first audience. Fourth, with regard to policy. I would simply point out that misunderstanding is and continues to be the rule of the day and we tend to confuse our vocabularies. For example when we use the word defense and we use the word offense we mean exactly the opposite of what many Pakistani’s do. We say we use drones as a defensive operation. They think we use drones as an offensive operation. We think that – when they say that it’s necessary to create relationship with Jihadi groups, they’re using the word necessity in quite the wrong way. They think that they’re actually responding to an extremely difficult problem on the ground and are kind of doing bargains. So we see complicity and they see politics. Now there are right and wrong in all of this and we can talk about what the right and wrong might actually be. But it comes to a head in almost every policy issue including foreign assistance. We think of bi-lateral assistance as being something that’s helping the state. Many Pakistanis see it as being either useless or too small, or creating conditions that cannot be fulfilled. So you have a communications barrier that far – is far larger than any of the actual policy content on each of these issues. So whether or not the Americans have more or less leverage in bilateral or multilateral assistance doesn’t change the fact that most Pakistanis think the Americans have all the leverage and that they have very, very little. So a lot of this is about uncertainty. It’s also about a feeling of powerlessness. Fifth. With regard to the relationship again, I think it’s worth pointing out that for all of us who may care very much that Pakistan succeeds, caring about Pakistan and caring about Pakistanis is not the same thing as having Pakistan trump everything you do. For the United States single country relationships are important but we really care about Pakistan because of the place in which it lives, the people who live there and how often they go elsewhere. It’s been a place of crossroads before and it will be a place of crossroads now. Now that makes a very big difference in the way that you think about the tilt toward Asia from the point of view of the United States, which will be big and important but Pakistan is either in it or it’s out of it. And if Americans see the Pakistanis as being deterrents in it, it will be out. At that point no one is going to work very well together. The second is to say that in all of this the way that we deal with who our interlocutors are is extremely important. Now we’ve now endured ten years – and not the first ten years, in which visiting Americans get off airplanes and make a beeline for the army chief’s house. They don’t make a beeline for the prime minister’s house; they rarely make a beeline for the president’s house until after they’ve done all the rest of their consultations. Try to imagine the same thing happening almost anywhere else or in reverse. This is not the first time. It happened in the ‘60s; it happened in the ‘80s, it happened for a while even before this past decade. But it means that the civil military relationship as we see it and as we diagnose it to be wrong, is both a cause and a consequence of the relationship that we have had with Pakistan as well. All of which is another way of saying everything is much more complicated than it seems, is much harder to dissect, but there are some things that are right and some things that are wrong and you can’t demand that your diplomatic interlocutor be democratic, participatory, and representative and then not treat it as if it’s trying to be so. I don’t mean this in any to excuse Pakistan for its low crimes and misdemeanors when it comes to the way it governs itself. But it does mean that if you act as if you’re entirely reacting to what you see as something expedient in another country, you are not going to get what you want out of that relationship. So let me leave with the following few points. Everything I have said is part of a narrative that has existed between the United States and Pakistan for now almost 70 years. That’s a very sad narrative and it’s a very, very long time. The agendas have generally been short-term and reactive. There are however some very important long-term agendas, which are going to demand both the relationship to get better and each country to get better in it. The first as I said is this changing security architecture of Asia. Now Pakistan is kind of the off to the side here, the big population centers, the big capital centers, the big places of capital flow are next door. It’s India and it’s China. If a tilt is to be successful however, all the small countries surrounding it are going to have to be embraced in it. So that’s one challenge to think about. The second is population growth. Pakistan’s population growth is out of whack with what its capacities are going to be. And this is directly tied into its problems dealing with and planning for environmental sustainability, energy and frankly climate change. There isn’t enough space, there isn’t enough land, there’s not enough money, there’s not enough water. So this is not a small issue. This is perhaps the one that looms greatest. And there isn’t enough in and among its neighbors either. So if any of us were looking at what this country is going to be like, look at what it’s going to look like physically as much as anything else. And recognize that 180 million people is probably already too much for its resources. So either the country is going to have to change the way it trades and the way it develops or everyone else is going to be held responsible for how to make it better. And then I’d say the last is in fact the complex challenge of what counts as good governance. I think the Americans and the Pakistanis differ as to what counts as the bottom line for creating a capable and responsible state and also disturbs what counts as each other’s version of what is right and wrong in policy and in action. There is no question that from the point of view of the United States the way that the army, and for that matter the civilian government in Pakistan deal with Jihadi groups, deal with extremists, deal with militants is wrong. Americans thinks it’s wrong not only because it’s bad for the United States and its allies, but it’s bad for Pakistan. It’s self-defeating for Pakistan. But until and unless Pakistan develops the apparatus and the capacity to think about this more constructively it is going to be in the business of doing what it is doing now, and it is essentially in policy terms eating its young. And that is a very, very bad way to try to construct a relationship. Now all of this is about not just what the United States and Pakistan do with one another, but it’s really about the way that Pakistan acts and continues to develop as a global actor. And that means thinking seriously about the way it treats its own minorities, but what counts as free expression, but how you participate in a world of high technology. None of this is settled yet. I think the most positive thing I can say is that it isn’t settled. This is not as if a story has been closed and we’re trying to cope with the detratives. It is in fact a country that is developing, it is changing and we have a choice deciding whether we’re going to be part of that development in a constructive way or we are simply going to leave it aside or malign it and leave ourselves open to the consequences of that. So I’ll leave those judgments and hope we have a conversation about all this. Thank you. Mohsin Khan: Thank you, Paula. Shuja Nawaz: Thank you both very much. As advertized and as promised this is very interesting and provocative comments by both our speakers. And I should also thank Ambassador Haqqani for having taken the trouble to share with us his views in somewhat abbreviated form of course. I did absolutely no justice to the ability with which he would have presented his views. We now move to the question and answers where this very excellent audience that we have here today will help us crack the Pakistan code to help us understand exactly what is it about Pakistan that is so confounding and confusing to people not only in the United States but also perhaps people inside the country. And then maybe we can help shed some light on it. As usual, if I may I will ask a question to each of the two speakers. That’s the prerogative of the moderator, with your permission. And then we’ll move to the audience and when I recognize you – and please bear with me, I will try and recognize you in the order that you’ve raised your hand. Please wait for the microphone to come to you. When it reaches you please ask a question, refrain from making a statement because we only have 40 minutes and I’d like to get as many questions as possible answered in this session. So I will need your help in that process. So everything is on the record, so we need for you to tell us who you are and then ask your question. Thank you. Now, question. To Mohsin. One very specific question and then an additional follow up to that. You talked about the IMF program. Now that’s something that you know more about than anyone else in this room. Under what conditions could Pakistan get a new IMF funded program? And is the government capable or willing to make the – or take the prior actions that might be needed to make that a feasible proposition for the U.S. and others to support? Mohsin Khan: Well, you know I think what’s going to happen is typically you’d look over the past program and say what was promised by the Pakistanis, what would they do and didn’t do anything. And typically what happens is those things that they didn’t do become prior actions for a program. So that just, you know basically would – it’ll be in the area of the areas that I mentioned, tax reforms, that’ll be in the area of energy sector reforms and it’ll be in the area of state-owned enterprises. Those are the sort of three [inaudible]. Because they all then fold into the fiscal deficit. But the very fact that the way you put it and the way I’m putting it is for a program these are likely to be prior actions abstracting from any pressures that might be put on the IMF, these would be prior actions. So the program cannot happen until they have undertaken these necessary policies. So in a sense, you know if you want to think about it this way, Shuja, I mean if the Pakistanis want a program, which they do, they must be willing to – up front to undertake those actions in order to get a program. And now how tough will those prior actions be? Because there’s a matter of degree. How much private sector reforms do you want? How much of a cotton subsidies do you want to get. I’m speaking as from the IMF point of view. Well that’s where the views of the major shareholders on the IMF’s [inaudible] board and the United States being the major shareholder, the most important shareholder in the [inaudible]. It depends on how much they press or say back off. This sort of – there’s a lot of discussions that take place prior to a program and so it’ll – that’s where I think the influence will be. But I’m taking while answering your question, these will be prior actions and the Pakistanis know that. It’s a question of just how strong will those prior actions be. Mohsin Khan: Thank you. Paula? Mohsin Khan: You talked about the civil military divide. And that’s something that has bedeviled not just internal politics in Pakistan, but the U.S. Pakistan relationship in many ways. How do you see this developing? Or is this going to remain a constant problem for the country and for this relationship, especially in light of the fact that you mentioned the growing activism on the part of parliament and even the courts inside Pakistan, which has some would say relatively diminished the ability of the military to influence decisions inside the country? Paula Newberg: That’s one of those either or questions to which the answer is yes. The last decade has in some ways not helped the cause of civilian dominance in policy and in practice. And in some ways you might hope that with the diminution of military activity in Pakistan you might see the beginning of a kind of normalization of U.S. Pakistan relations that would allow for something of a withdrawal of the military from paramountcy in policy. That having been said, it’s very hard right now to look at Pakistan and say here’s what the constitution says and this is therefore what you should do. And it says that there’s parliamentary supremacy and that’s it. Everyone is constantly jockeying for influence pretty much behind the scenes. So you could say that everything that parliament has done has been in aid of verbal or rhetorical recognition of something that hasn’t yet happened. Similarly you can say that for each moment and that the court looks as though it is rapping the military on the knuckles, it is allowing other things to happen. So you talk about cracking a code – my general feeling is that anytime I think I understand what’s happening in Pakistan I just turn myself around a whole lot of times until I’m restored to their appropriate level of disequilibrium. I don’t think you can say this is going to happen and this is going to happen. I think what you can say is that the country is a lot larger and lot younger than it has been in a very long time. It also has a far more global young population and there are going to be pressures on that population and by that population to act differently because reality is not going to allow it to act as it has now. Beyond that I have no doubt that the cards, at least for the moment, still lie in the hands of the military side in this civil military relationship. And it’s going to take a huge leap of faith on behalf of parliamentarians to believe that they can act without reference to that. Because thus far that is their primary interlocutor when it comes to looking at foreign policy. Shuja Nawaz: Thank you. I have a question at the back. Seth? Seth Kaplan: Hello? Yes. Seth Kaplan, Johns Hopkins University. So we’ve heard a number of times about the so-called necessary reforms that Pakistan must undertake. We’ve heard about three, I’m sure I could name at least three others. So my question is is the reason why these reforms don’t happen because the government is too weak? There’s vested interest to oppose? How would you interpret the lack of reform? And then what scenario – what change in the political dimensions or the political dynamics of Pakistan could lead to a more pro-development or pro-reform group coming to power? How would you interpret the present and the possible future? Thank you. Mohsin Khan: Well, you know on – let’s track from energy sector reforms because that has sort of engineering type issues. And then focus on one particular reform, which is an interesting one, which is tax reform. Okay? Now everyone agrees on the value added tax. By the way, this is independent of – and this covers the point – President Musharraf tried, Prime Minister Shaukat Aziz tried when he was finance minister of tax reforms, tax reforms even. But let’s talk about the VAT, which is an important tax. So the government is on board with the VAT and it goes to the senate of Pakistan and is passed by the senate. It’s about to go to the national assembly and one of the coalition partners, the MQM says that if you go through with this reform we’ll leave the government. You are at an impasse. So you’ve got a choice, you know you know you can’t push the reform through. So it’s the politics there that created it. Now VAT’s a good example of the fact that politics has constrained the government from proceeding. On state-owned enterprises, that’s the other form and refers to the other point you make, vested interest. State-owned enterprises have been historically a place of – you know where you engaged in patronage and you employed – I mean it’s very clear that the railways and Pakistani airlines have possibly five to ten times the number of employees than warranted. And those are all party members that are being put there. So I think, you know politics is going to be the major constraint. What’s going to emerge? I mean there is the plan of the [Inaudible] Hans group of [inaudible], which is I suppose if he were to become the prime minister, his minister of finance, as [inaudible] has put forward on these. And they all talk – I mean he talks very nicely about tax reforms, he talks very nicely about energy sector reforms, they all talk about these. They know what the problems are and they know what the solutions are but whether they can deliver them or not is still very much up on the air. So I’m sorry, I mean I really don’t see a major tax reform coming into the country. I do see some sign of state-owned enterprises, rationalizing state-owned enterprises and there are of course a whole set of other reforms, which will be – some will be easier than others. But I’m telling you that we’re – as you know and I’ve written on this – we’re in a world of coalition politics in Pakistan and if you’ve got coalition politics whereby members of the coalition come from particular sectors or particular areas of the country, and Karachi being the prime example, then you’re going to face this problem. And you’re going to continue to face it. Shuja Nawaz: Mohsin is referring to a piece that will be appearing soon under our joint names. That will help explain everything in 700 words. Shuja Nawaz: We have the next question here and then Harlan after that. Bill Metzer: Hi, Bill Metzer with Oceana Energy. I read with interest the New York Times story this morning about what’s happening near Quetta and the violence being perpetrated on Shiites, particularly the Hazara. And this raised a question. And let’s assume that I am a younger version of Shuja, I’m a young brigadier, I have a bright career before me, I have commercial opportunities. I’m part of the in-group. And let’s assume I’m in Iaside. Now let’s assume that I like this idea of strategic space and I like this idea of accommodating Sub rosa, these extreme Islamist groups because that serves some of my short-term interests vis-a-vis India and vis-a-vis other groups within Pakistani society itself. My question is first that looks a little bit like the Saudi princes and the Wahabis clerics to me. But secondly is it really even in my interest? Because the social price of this kind of accommodation seems to be quite high. I mean nothing I’ve heard here would indicate that Pakistan isn’t on the verge of tearing itself apart with the worst kind of inter-sectoral violence. And is that really in my interest as the young Shuja? Even in the short term? And if it’s not just from an army perspective, what should I be doing about it? Shuja Nawaz: Paula’s going to answer that. Paula Newberg: I knew you were going to say that. I have an – he’s going to answer that because I’ve never been a young brigadier. Shuja Nawaz: Neither have I. Bill Metzer: We’re not picking the group that you’ve suggested to dominate. Shuja Nawaz: Yes. Okay. Let me attempt to see if I can clarify this situation for you. First, there’s never really been a proper national debate in Pakistan about the nature of the country. This has been partly because Pakistan has had long periods of military rule or civilian rule, which has been autocratic. And as a result what passes for debate is really a very controlled form of discussion among the elite. And so having made the statement once at a gathering where a well-known Pakistani diplomat and analyst was present, I was told that there’s a debate every day on television on Pakistan. To which my response was that taking the same ten people and moving them from one studio to the next does not a national debate make. So that’s – there’s been an absence of this introspection which is very necessary in Pakistan, not just for the civilian but for the military. I think to some extent this may be happening and it’s being forced by economic circumstances among other things. But I think it’s also going to become necessary by the forces that Mohsin and Paula mentioned, the demographic shift, the globalization of economics, dependence on neighbors and the fact that you have to open up to India to grow Pakistan’s economy will force a change. But don’t expect a change overnight because it’s not going to happen overnight. The forces that have been in control for so long that have profited from this no war, no peace in the neighborhood are going to resist very strongly and I don’t see that happening easily. And I don’t see that happening easily without a civil military discussion going on on a continuous basis. Paula Newberg: Could I just add a comment? Paula Newberg: Because that question also refers back to the earlier one to Mohsin. I mean there are ways in which there are debates that take place each day. I’m not talking about three people screaming at one another on television. There was a small NGO about two years ago in Pakistan that actually tried to have a national discussion about what’s known as the objectives resolution, which is the perambulatory page that no one understands at the beginning of the constitution. And what they found is, they went from place to place around the country convening small civil groups, was that every single group if not every single person had a completely different view of what it meant or what it should mean. And most of those views were kind of entrenched views. So what’s missing in a way is a form of far more dynamic, far broader political recruitment that not only changes the nature of the civil military debate, but really changes the nature of what politics is and stands for. Because every institution – political institution in the country resembles to a frightening degree now, what it was like 30, 40, 50 years ago down to the interests in the families who represent it. Now interestingly and somewhat oddly – and every time a military government has come in, it has decided that the problem is at the grassroots level and that what it’s going to do is reform what is known as local bodies politics. The problem is that each one of them does so by trying to create a constituency for itself. Every time the military leaves the next civilian government comes in and it simply cancels whatever the military government has done, right or wrong. Leaving as you have now, an absence of politics at the local level. So the national parties tend to then dictate what happens at the local level saying at the same time that their interests come from those localities. So it’s a very fraught relationship, which doesn’t allow for a political structure that is open and honest in many ways. And in a way the media reflects that as well because it has the same problems of ownership and control that every other part of the political society has. Fair enough? Shuja Nawaz: Thank you. Thank you. Harlan Ullman: – all three of you and my question is this. What safeguards or what’s going to prevent an implosion? By every measure that I see in Pakistan things are getting not only worse, but much worse. I think it’s very unlikely, though he disagrees with this that Ausips at RANPPP will win a majority and therefore reconcile some of these things. Pakistan has been ruled basically by three and a half families for 65 years who practice schoolyard politics but with real bullies. The military is overstretched, tremendous pressures that are going on, the economy is getting worse, there are 90 million kids 20 and under with no places to go. President Obama has a visceral dislike for President Zardari and there’s nobody on our side or their side who really can be kind of a means of connection. The special representative has just been replaced and you got Doug Lute talking to Kayani rather than somebody of a higher level. So is this just a situation as Adam Smith said there’s a lot ruin in a nation and Pakistan will get by. But if not, if the situation is becoming as perilous as many of us think, and I think that the religious and ideological rivalries and terrorism is really almost getting out of hand. Karachi is much more of a wild west today than it was three, four, five or six years ago in my view. What will prevent – are there safeguards, are there any things that can be done on the Pakistani side, the American side or a third party that can try to prevent what could be a huge implosion? It’s to all three of you. Shuja Nawaz: Mohsin, you wanna try your hand first? Mohsin Khan: Let me try and – I mean I’ll just make the point on the economy. I mean the predictions of the complete collapse of the Pakistan economy have been going on for two decades now. I mean there’s been ups but then there’s been real downs. And what I’ve been trying to look at is what keeps the country afloat. And where in fact – you talk about, you know yeah, there are 100 million Pakistanis under the age of 30 and it’s not as if they’re all looking for jobs. And if they’re looking for jobs why aren’t they sort of, you know why don’t you just see them in the streets? And there are thousands or hundreds of thousands looking for jobs or something to do? And there I think what I said was – in my talk was basically the growth of the informal economy has in fact supplied jobs to these people and they do work, has supplied economic activity in the streets. The streets are bustling and the traffic jams are crazy in Lahore and in Karachi. It’s not [inaudible], but certainly are crazy in the cities. I think that you know I don’t see an economy that’s – on certain indicators it’ll look – it should have been collapsing, but it isn’t. Something’s going on there that is keeping it afloat and remittances are keeping it afloat, the informal economy is keeping it afloat. There are, you know if you think about a hundred – population – the size of 175 million people in Pakistan of which what you have identified as the people who the extremists, the radicals, et cetera, what proportion of the country’s population do these people make up? A very small amount relatively speaking. A very small amount. I think that, you know I’m always intrigued by the expertise sitting around in this city that sort of points the finger and says you’ve got A, B, C, D and E wrong and these things are happening and you’re gonna collapse. What’s gonna keep you from collapsing? Well, the fact is that, I mean from where I sit I’ve heard this story for two decades now coming out of here. Not just here, meaning Washington, but elsewhere too. It hasn’t happened. What I’m trying to do is look for reasons why it isn’t happening. And a lot of people have now – in Pakistan are sort of accepting the idea that something is going on in the economy – I’m just talking about the economy at the moment. Something is going on in the economy that’s keeping it going and the danger I see there is the sort of, you know the thinking that goes on in my own professional class of people that says that somehow, you know there’s this informal economy and you’ve got to bring it into the official economy. My view now is a little bit different. I say see what’s going on in the informal economy and see if you can’t change your official economy to start reflecting those kind of things that are going on. For example – I’ll give you the example about if you need five building permits in order to put up a house, and on the other side you need nothing. You know you need no permit whatsoever. Maybe there is some happy medium whereby, you know you need only one permit to get – to build a house. Try and learn some lessons from what that economy, that unofficial – that informal unofficial economy is trying to tell you. My friends on the economic team of Pakistan are not ready to buy all that, but I’m trying. Bill Metzer: [Inaudible] the answer not having you ask it. Paula Newberg: Well, but I think if you ask it differently it leads you to a slightly different conclusion. I mean I’ve been trying to understand for more than 30 years now why Pakistan doesn’t have a revolution. I mean many of the same factors that you’ve just listed would suggest that somewhere people should be mobilized to try to overturn things. So – and the answer usually turns out to be one or both of two elements. One is that people harbor the hope that with each day they will do a bit better, or with each year. And therefore they don’t want to rock the boat. Or alternatively that if they try to rock the boat they will end up worse than they were before. Now both of those answers in a way underscore what Mohsin was saying that there is more there than one sees when one looks superficially. I think to that you need to add that in some respects for all of what we see reported here, and to a large degree what you see if you spend short periods of time often in Pakistan, disguises those elements of the society which are not changing. I mean get out of the cities, which are changing very, very dramatically. Much of the rural area is very similar to what it was before, both in terms of the structure of poverty, the structure of production to the degree they have it, and the alienation from the state as a whole. That you and I might see as an incentive to try to change things, but could also be seen as an incentive not to bother because nothing they see about the state suggests that wanting to be closer to it is a very good thing. Add to that a series of fears that are hard to quantify. I think if you step back and look at the relationship between this country and Pakistan one of the saddest elements is that a lot of it is motivated by fear right now. It’s fear about what goes inside Pakistan, it’s a fear about what goes in things that are in Pakistan leave the country, it s a fear about what the Americans might do to Pakistan. So there’s a kind of lock step there as well. I think that’s very sad because there is a good deal more opportunity and talent in the country than that sort of mentality suggests. It doesn’t actually answer your question, but it does suggest that sometimes even bad ossified politics can keep a place from falling apart more effectively than you might actually guess. Shuja Nawaz: Thank you. I just want to let everyone know I’ve tried to take down all the names and people that have raised their hands in the order that they raised their hands. And if we’re going to get through this in the short time that we have at our disposal, when I call on you please make it a short question and we’ll try and give you a short answer. So the next question is the gentleman over here. And this way we’ll try to get as many of you as possible unless you’re willing to stay beyond the 3:30 hour. Wynia Sheikh: Excuse me. Wynia Sheikh. As the world has emerged we see that there is more track to the world peace from failed states and regional conflicts. We also know that Pakistan has been known to have tremendous potential for growth and prosperity. What do you see, or do you see any change in the U.S. policy towards Pakistan to bring out that potential that works not only for Pakistan but for the region and for the global world? And my second question is there – do you see anything happening on the Kashmir policy in Obama’s second term? Mohsin Khan: Well I’ll take the second one and say no. Shuja Nawaz: Good. Thank you Mohsin. Paula Newberg: I could take the first question and also say no. [Inaudible] get a very simple response. Shuja Nawaz: Let me see if I can pose the question. Do you see a change in U.S. policy emerging? Paula Newberg: Right now I don’t, although I see the possibility that there could be. On the other side you have an equal possibility that post-2014 it will simply be decided that now we don’t have to deal with this problem and these questions, and we will move on. I don’t think it’s a set game yet. Shuja Nawaz: Thank you. Aparna? You had – okay, the lady next to you. Sorry. Maryam Arif: Maryam Arif, I’m a lawyer based in Lahore and my question is this. Some political analysts in Pakistan are saying that the Pakistani state has lost its writ in 60% of the country. Do you think then that the inability to deal with terrorism for example is – do you think there’s a lack of political will or maybe at this stage just – that it’s just impossible for the Pakistani state to stand up to militants? Paula Newberg: 60% seems rather high to me. I mean even if you just look at it geographically, it doesn’t appear that 60% is outside the writ of the state. You could suggest that the state isn’t doing a very good job in 60% of the state and that might actually be true. Now whether the cause of this is entirely based upon the nature and the breadth and depth of terrorism is another story entirely. Yes, I think there’s a reluctance in Pakistan to deal with the causes of terror and therefore with its consequences. But I think the weaknesses of the state go beyond that and are more varied and in that sense they may also not be quite as bad as your analysts are suggesting. Shuja Nawaz: – and the economy in the Punjab gets a boost over time, that some of this resort to asymmetrical war could change. Paula Newberg: True. But you know the other thing, we really having talked about Afghanistan. And one major issue with regard to that piece of land that is in fact absent in the state’s thinking right now, is what happens in Afghanistan post-2014. And the small things that have been attempted between Pakistan and Afghanistan in the last year to try to set the stage for a more normal relationship may prove not to work, but it may at least lead people to think that maybe it’s required. Shuja Nawaz: Thank you. The gentleman there and then we’ll have the question over here. Stephen Engelken: Thank you. My name is Stephen Engelken. I just retired from the foreign service a couple of months ago. I was in Pakistan a lot for the last couple of years and I’m thinking of putting my place – myself in the place of people in C Street right now and we’re going to have a new – purely a new team dealing with South Asia here in about a month. The Secretary is going, Ambassador Grossman is departing, who knows we may even have Senator Kerry come to the State Department. What should we tell the new Secretary of State we should be doing with our economic assistance to Pakistan? In my time in Pakistan, Pakistanis were absolutely dissatisfied with it. Totally I got nothing but complaint about it. Americans aren’t very satisfied with it either. It clearly cries out for a new look. What should – how should we direct assistance – economic assistance to Pakistan? And how should we re-craft it? It cries out to be relooked by the next – by the second administration. Shuja Nawaz: Thank you. Mohsin, you want to give your advice to the new Secretary of State? Mohsin Khan: I think the new Secretary of State is going to get a lot of advice. I mean a lot of working groups, some of which I’ve been part of on aid to Pakistan. I think you’re absolutely right in the way you’re characterizing it that, you know both sides are incredibly unhappy with the situation. I mean this is a bad marriage in some sense or has the characteristics of a bad marriage. I really think that the Pakistanis need to be reassured not so much in terms of – I mean you know people seem to think that there’s just one player, or one or two players in Pakistan on this aid issue. You know the aid issue is a complicated issue because it involves financing. So that – there you have the central bank and the ministry of finance involved in it. You have the where does the aid go, you have the development ministries involved, you have the provincial ministries involved, et cetera. You have a lot of players on the other side, each with its own demands. I think that it would be fair to say and I’m not privy to all that goes on – it would be fair to say that there hasn’t been enough significant thinking in Pakistan about the aid issue. I mean there’s no sort of – there’s been no sort of comparable working groups in Pakistan that sit and say, you know how much do we expect, what do we need, what do we need it for, et cetera. And ideally, you know if I was advising the new Secretary of State, I would say to the Secretary speak to your counterpart, you know and say come with a plan on what do you think, you know what is needed and then where will it be used, et cetera. So you have an idea from the recipient as to what their needs and the other. Unfortunately in many cases U.S. aid has been determined here in Washington or in the embassy in Islamabad. And you know – whoever their contacts are, et cetera as to who needs the money and who should get this and who should get that. U.S. AID story is – to me it makes me smile, it’s an extreme case – is you know you get a new administrator and the prediction was – and in fact I was asked for that prediction is what kind of aid – what’s gonna happen with aid to Pakistan. I said it’s going to go primarily into health. And why is that? Because the new U.S. administrator’s a doctor. I mean that’s why it’s going to go into health. I mean [inaudible] people, you put an engineer and you go into the engineering side. It’s that kind of thing. So you’ve got to have a – you’ve got to have a serious dialogue and that serious dialogue beyond just the ministry of finance, beyond just the ministry of – well the ministry of finance really. Beyond just the ministry of finance in Pakistan. Paula Newberg: Just a couple of bullet points anyway. One, the amount of assistance that goes to the civilian side is a pittance compared to the amount of money that goes to the military side. So we spend a great deal of time arguing about the smallest amount of money first. Second, to the degree that the United States or other donor countries believe that their relationship with Pakistan or countries like Pakistan is determined by their aid relationship, you already have introduced yourself to failure. You have a diplomatic relationship, you don’t buy it with assistance. And thirdly, given the amount of critique that comes about the way that the United States handles its assistance or in some instances it doesn’t provide it, I think there’s an easy lesson from something that Mohsin said in his more formal comments. And that is look far more to the multilateral side as a way of partnering your money and making a far greater investment. And that by its very nature requires the participation of the Pakistan government in determining how it’s to be done. Shuja Nawaz: Thank you. Diana? Shuja Nawaz: If you could please – identify yourself for our audience. Diana McArthur: Oh, yes. My name is Diana McArthur and Shuja knows I’m building a school in Pakistan and private, private. No government money, no NGOs, just private individual money from Pakistan industrialists and from me. And we are finally going to float our tender. It took four and a half years. The question is where are the adults running anything? Now, if we were to read the New York Times we would have questioned who in our Congress is an adult that we’re getting any work done. Last June sitting in Pakistan waiting for the architects and engineers I read Dawn and I would finally end up saying what is going on here, who’s running anything. We had the – shall we say, the removal of the Prime Minister to the point that an article written, we have had coups, we’ve had executions, we have had incarcerations and I wonder when we will ever just have an election and vote somebody out. And at the same time there were charges and countercharges about some mysterious man said in the dark of the night he was having meetings with the Chief Justice over whatever, whatever and then he was charged with treason. And it was a circus. So one would have to say from a point of view an American, where are the adults then running the country if this was the kind of sort of histrionics and character assassination and back and forth and legislature. Is it really the army that’s doing this or whatever, you would have to question who is running the country to answer some of the questions that we heard today. But we have had some of that problem here in this country too. So it can happen. But from that point of view because you’ve answered it again many times, questions like this. If you were to see all of that happen in one month in Pakistan and you’re just visiting from anywhere and you’re reading about it every day in Dawn, what would you think? Shuja Nawaz: Well maybe I’ll give you a short answer if I may, and that is going back to the point that all of us have made about the demographic shift. With a population of maybe up to 200 million once the census is completed and 100 million below the age of 22 because the median age is 21.9 at last count. At some point the mantel has to shift to the younger generation and elections are the best way of effecting that change. So maybe the election process will throw up more leaders that are in tune with the needs of the people of the country. Just a little footnote. In a recent visit to India I was asked to write for India Today and I mentioned this median age in the two countries. And in India the median age is close to 25 or 26 and the average age at that time of the Indian cabinet was 65. So there’s a serious disconnect between the rulers and the ruled. Of course Prime Minister Manmohan Singh saying, probably after reading my article I say modestly, changed his cabinet composition and reduced it by a couple of years on average. Mohsin Khan: If I could add a footnote to that. I mean the census there is very important in this issue because the rapid growth of the cities and the urban population is going to throw up politicians and candidates who do not have an allegiance to the old futile structures that exist in Pakistan. So you’re gonna get much less of that, of you know just because your father held the seat, you’re gonna hold the seat now. You’re gonna run for – that’s what Imran Han is counting on in his sphere, he’s counting on the urban centers and the urban youth in voting and that’s a young population. So maybe there is changes. Shuja Nawaz: And you’re helping by setting up a school in the northern areas of Pakistan. Diana McArthur: Yes. I hope so. Shuja Nawaz: Next question. Barack? Barack Sheffi: Yeah, Barack Sheffi. Mohsin, you had addressed tax reforms in Pakistan. Goodness knows we need tax reforms really badly in this country. But – and you had also addressed some of my earlier question that I had in mind as I’d been waiting for the mic, but I just modified. You had mentioned the informal economy, call it the underground economy or the black economy and you had also discounted that the government doesn’t wish to impose a VAT, valued added tax. But is the central government, the federal government, local governments, are they collecting taxes from revenues at least generated by this informal economy, which as you said is half off the total economy? It must be a huge, huge amount not to be sort of pursuing. Thank you. Mohsin Khan: Well, Barack, they’re not actually collecting – they’re collecting a small part, but anything that touches on the documented economy like for example in the sales tax area, et cetera. But the problem – I mean if you want to talk about tax reform, there’s a constant talk about income tax and VAT and so on and so forth. I think the biggest problem is that the promises that the area of services and agriculture lie by the constitution in the provinces. And the provinces are not ready to do that. That was my – what I pointed out was the mistake of the 18th Amendment, which was to transfer responsibilities and the money. They should have had a quid pro quo deal with the provinces that look for every rupee that you are transferred from the central government, you will raise, you know 10% of that in taxes or some form of that. They have no interest whatsoever in putting any taxes on the things that belong to them, the provinces. In some services there are – for example the thing about car registrations and motorcycle sales and so on and so forth, there are taxes in that. But it’s petty; it’s miniscule. I mean if I, you know – you come to me and I have a motorcycle and I sell it to you, Barack, in the street of Lahore and you give me cash transaction, nothing is reported. No – you know nothing will happen. And that’s the way it typically takes place. That’s how the informal economy works. Shuja Nawaz: Thank you. I know that you all want to ask some more questions. We’re already way over the time that we’d originally set for it, so with your permission if I may, I’ll go to the last two questions. So we have Gary and then we have Polly at the back after that. Go ahead, please. Garrett Mitchell: Thanks. I’m Garrett Mitchell and I write the Mitchell Report and I want to ask a question that I think sort of pokes around in the same neighborhood as the one posed earlier by Harlan Ullman. But I want to try a slightly different starting point. Through countless sessions on Pakistan and really particularly in this one, I’ve wanted to ask this question, so I’ll pose it pretty quickly. If you look at the last 65 years and the roster of countries that have been able to make themselves successful beginning with Germany and Japan and then South Korea and Singapore and Turkey and Taiwan, et cetera – and India. Pakistan isn’t on that list. The metaphor I’ll use is it’s an airplane that’s sitting on the runway. And my question is A, if that is a reasonable characterization, why is that? What are the factors that have kept this plane on the runway when a great many other planes from around the world have been able to take off successfully? Mohsin Khan: Well, that’s a tough question. I think that there’s a lot of factors that have kept Pakistan from [inaudible]. There have been periods of time where there’s been a great deal of optimism about the development in Pakistan. And you talk about 65 years – in the ‘60s for example – ‘50s and the late – ’50s and the early ‘60s, back then was at the takeoff stage. The civil war, the Bangladesh experience, subsequent to that the socialist experiment of Zulfikar Ali Bhutto, the military rule. Again, recently in the 2000s, this century, a great deal of optimism. Growth is now 7%, consumer spending is going to skyrocket, we’re gonna become an industrial country and so and so forth. And then the whole thing collapsed again. There’s been cycles. I mean there just hasn’t been that sustained progress in the country. Garrett Mitchell: – that in any way as a put down. Mohsin Khan: No, no, no. I understand what the – where you’re coming from and I think – let me just give you – because I can’t get into it. Let me just give you a glib answer on that. Somebody went to President Zardari and said look, your country is not doing well economically. Your country is not doing well at all. Look how it compares to India. It does – compares very badly to India. It’s comparing badly to Bangladesh, it’s comparing badly to Sri Lanka, just looking at the neighborhood. What do you say to that Mr. President? And President Zardari said this is comparing apples and oranges. This was not apples and oranges, apples and apples you know the same people across the border. Bangladesh was part of you, it’s apples and apples. And his answer was India’s had 65 years of democracy. Bangladesh has had some form of democracy for 20; Sri Lanka’s had it for 20. I’ve only had it for four. When I’m at 20 years of democracy, you come and ask me that question. Shuja Nawaz: Thank you, Mohsin. Polly? Polly Nyeck: I’m Polly Nyeck, I’m an independent consultant and I have a – I was very struck by Mohsin’s description of the role of the informal economy and thoroughly concur with it. But I do have some questions as we think ahead to the demographic changes occurring that stem in part from some of the points made by Paula, which is first do we not have limits as Pakistan is increasingly knit into – and it’s prospects increasingly depend upon the international economy going forward? Limits that are set by skills and education deficits in Pakistan. Is Pakistan not gonna run up against even in the dynamism of the informal sector, these limits of its institutional output of education and skills? And how else – what other factors do you see as complicating the sufficiency of the informal sector keeping the burgeoning youth population from bumping its chin against a small formal economy? Mohsin Khan: Polly, my – without – didn’t want to be misunderstood. My point about the informal economy was what has kept this economy from collapsing? It doesn’t say anything from will it keep the economy going into the future? Now you raise a very good question. I think eventually you’re gonna have to – I mean this cannot go on because if you’re going to interact with the global economy you cannot do it by the informal – well, the informal sector does it by the way. I gave you example of software development and things that’s going on. But I think I would come back to what I said earlier. I think that to me the ties – improved ties with India at the moment and then with the region in more generally is going to be a game changer for the country. And I’m just – I’m very hopeful that that might be the way [inaudible]. Because you know – yeah, because I mean when we talk about trade with India, not just talking about trading goods and consumer goods and engineering goods, I’m talking about, you know education, medical facilities, these things where India is far more advanced which could offer Pakistan an opportunity. For example – I give the example of if India would reserve some seats for Pakistanis in their IITs, in their engineering schools. This would be a great benefit to Pakistan. I mean these are the kind of things one has to start to think about. So once relations open up between them, maybe these things will happen. But I think the exit to Pakistan from this morass or wherever it is, lies in – and this was something I told – excuse me – I’m sorry, I [inaudible]. When discussing this issue of India Pakistan trade with some members of the military at one point I said look, let me put it to you simply. India is the engine of growth in the region and, you know it’s the locomotive. You either hitch your wagon up to this locomotive or you’re going to get left behind on the station. That’s the way to look at it and I think that that is the way the country – fortunately the government in fact said – and the military by the way, is looking at it. Shuja Nawaz: Thank you. You’ve all been a great audience. I really appreciate your patience. I know there are at least two or three of you that I have not been able to include in the public questions, but I’m sure Mohsin and Paula will gladly answer your questions if you come up. Please join me in thanking our two speakers and also in thanking Ambassador Haqqani.